Glebe Record Fair. It happens twice a year, and it’s the biggest record fair in Sydney. It’s been going for as long as I remember, and I’ve gone every time it’s on (and I’m in town) for over a decade. I started this journey of trying to not only expand my vinyl collection, but write about. Knowing full well that my feelings about it all will change over the course of the year. And it’s true, standing at Glebe Record Fair, I realised some of things I hate about vinyl. First of all there’s a LOT of crap. And it’s the same crap over and over. The Beatles. The goddamn Beatles. It’s like every second bit of vinyl ever pressed was a Beatles album. And people still buy them! Who are these people? I would be surprised if at that record fair, there was less than 200 copies of Abbey Road in there. It’s also a nostalgia fest. I’ve been trying to hunt down a fair bit of 80s indie, 90s alternative, or weird new things. And those boxes usually have no one thumbing through them. But the same old Led Zeppelin, Stones, Beatles and classic rock stuff – people line up to go through those boxes. I didn’t get much that day. Only two records from that day will be written about. I decided after a bit of a wander that I am going to concentrate on the 90s stuff and later. I found a couple from Pacific Records, a former store that has become an eBay store. However, they are re-opening in Dee Why and I’m sure I’ll get out there and write about the store. They were having a half price sale as well. The record. Tonight: Franz Ferdinand. This record is just three years old, and I loved it when it first came out. But I’ve fallen more in love with it in those three years. It is a loose, trashy party album. It is a perfect album to go walking to, or to get dressed to. In my mind, it’s better than their debut. The big songs (at least in the UK) were “Ulysses” and “No You Girls“, both amongst the greatest guitar driven dance songs I’ve ever heard. The record never gets boring, and ends with the tender acoustic “Katherine Kiss Me“, perhaps the most direct thing they’ve ever done. New release vinyl is going through a golden period. This album is generously split over two records, allowing the sound of each track some real space on the album. The sticker with the album name is over the shrinkwrap, leaving a lovely clean image of the cover. It’s a thick sturdy package – a real treat. There’s one more Glebe Record Fair this year. Let’s see if I do any better at that one. I try to keep up with hype, if only to have an opinion. Seems like the early part of the 00s was full of hype records, and in Sydney at least, the spectre of the NME loomed large. As years passed and history took perspective, that ‘new rock’ revival can be appreciated in different terms. Band such as Cooper Temple Clause and Von Bondies fall into obscurity. 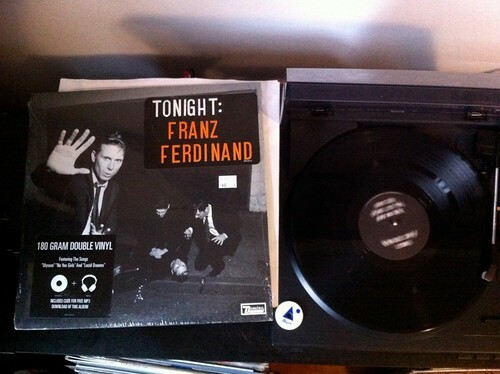 And this album, the self titled debut by Franz Ferdinand, still sounds great – truly a classic of the era. So this record hit the stratosphere, but it’s interesting to note that there is only one hit single. Take Me Out, a song that was tainted by over-exposure, but is now easing back into it’s place as a classic single. People will be dancing to this song for decades to come. And it’s not the only great song on here. The other singles – Darts Of Pleasure, Michael and especially Dark Of the Matinee – are all great. There is something seedy, something tense going on. The excitement of dancing, of a night that could go anywhere (the darker side of which is explored on their new album). And yes, some songs like This Fire are a bit clumsy (what a terrible lyric, why did they keep ending shows with this?) but they were striving to be different. It was a Bowie/disco kind of sleaze. Of course, this all came from the head. Franz Ferdinand are at art school band and everything has been thought out. From the cool imagery in their film clips, the minimal album cover… you can see they’ve studied the history. And I like art bands. I love a band that thinks about their album covers. Pity they dropped the awesome idea, bandied around for their second album, of naming it Franz Ferdinand again, and just changing the colours on cover of this album. So, for an album that very much captured a moment, it’s transcended that moment quite well. Having survived the hype and come out the other side, I assume I will be with this band for at least a few more records to come.